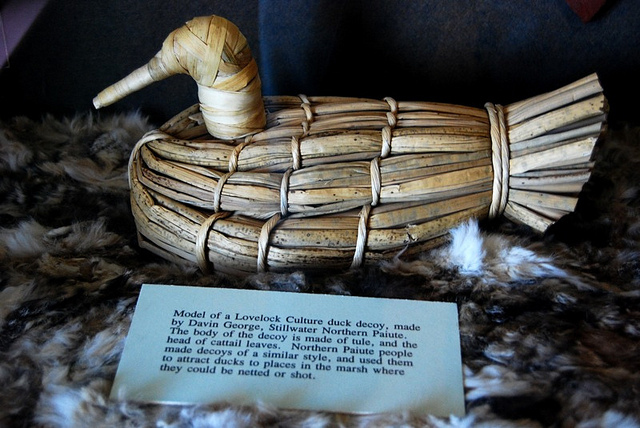 Model of a Lovelock Culture duck decoy, made by Davin George, Stillwater Northern Paiute; photo by Matthew B. Brown on Flickr (all rights reserved, used by permission of Nevada Magazine). From Nevada Legislature:"This decoy was created by Native Americans almost 2,000 years ago. Discovered by archeologists in 1924 during an excavation at Lovelock Cave, the decoys are formed of bundles of bulrush (tule) stems, bound together and shaped to resemble canvasback ducks."